Around the world where Christianity is practiced, Christmas Eve is a recognized quasi-holiday that is celebrated by millions of families. I have a cousin that started celebrating Easter Eve almost thirty years ago, as a way to get all of our families together, because all the cousins have families of their own and the holidays get splintered and family get-togethers are a rarer commodity with today’s life style. I think it is a wonderful idea and it is a great way for everyone to gather and have a good time, and it is isn’t for a wedding or God forbid a funeral. Not only that, but my cousin serves a great collection of Armenian appetizers for a few hours before dinner. She starts the party at four in the afternoon, and by the time we got there around four-thirty, the party was already going at full tilt with about thirty people already in attendance, and the crowds kept coming. By the time dinner was being prepared there was closer to sixty people with some more late comers after that, and the main course was grilled lamb chops and there was an overly generous amount of lamb chops that kept getting piled and piled on the platters and no one complained about not having enough to eat, and then add all the other side dishes and it was a feast. Then when everyone was fully sated it was time for dessert, oh the indignities that we all went through that evening. My cousin even went so far as to have the Lord’s Prayer transliterated into English and a copy was given to everyone for a prayer before the actual dinner began, and some people were actually surprised as they thought the appetizers were the dinner for the evening, because those plates kept getting replenished as needed. As for beverages there was not a want for anything, a bar was set up in the family room, and soft drinks, beer and wine could be found in the laundry room just off of the kitchen. Not only had people brought food and desserts, they also brought wine. I am only going to mention a couple of the bottles of wine that were opened that evening. 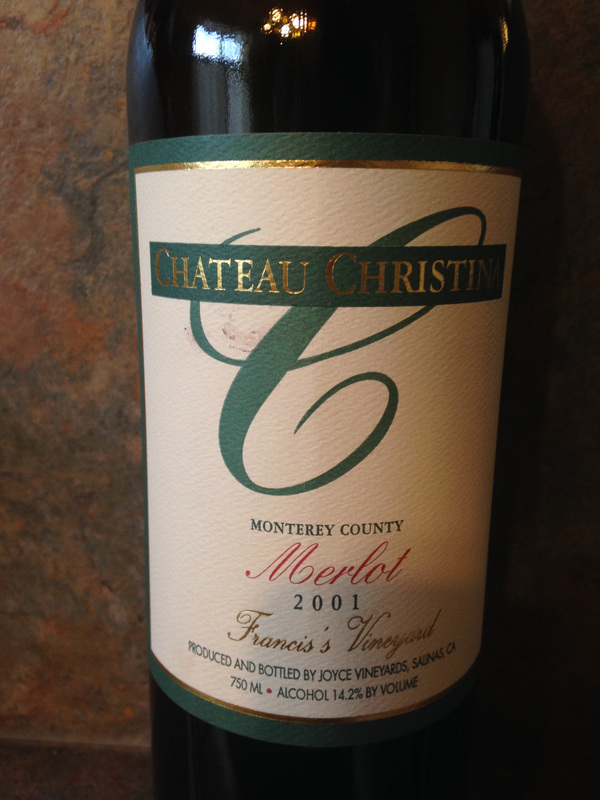 One of the bottles was Chateau Christina Merlot Francis’s Vineyard 2001 from Joyce Vineyards of Salinas, California and the wine carried a Monterey County AVA. This is a father and son venture by Francis and Russell Joyce and it was a very mellow wine, in fact some people were surprised that it was a Merlot, from the few Merlot wines that they have had in the past. Francis’s Vineyard is a thirty some odd year vineyard created by Francis Cavelli who matched Merlot clone rootstock to the land to create a low yield Merlot. The other wine that I am going to mention is Marchesi Antinori Tenuta Guado al Tass IL Bruciato Bolgheri 2011 from Tuscany, Italy. This was a blend of Cabernet Sauvignon, Merlot and Syrah. Bolgheri is one of the most prestigious areas in Italy and the DOC is for the land and terroir, as opposed to protect a certain wine varietal; as an example Chianti has to be for the most part Sangiovese. Bolgheri is famous as the birthplace of the “Super Tuscany” wines, which started with the release of the 1968 Sassicaia and how it changed Tuscan wines from that point on. 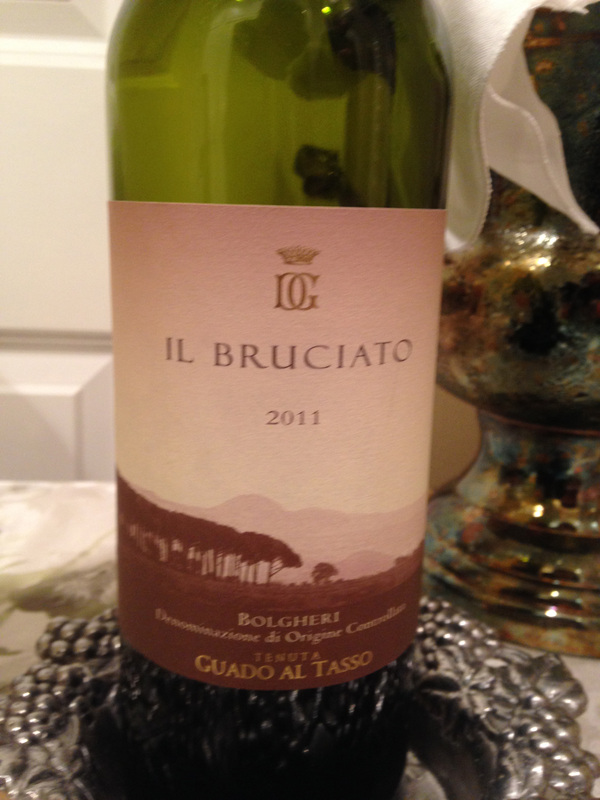 This entry was posted in Dining, Wine and tagged Bolgheri, Cabernet Sauvignon, California, Chateau Christina, Francis's Vineyard, Il Bruciato, Italy, Marchesi Antinori Tenuta Guado al Tass, Merlot, Monterey County, Super Tuscan, Syrah, Tuscany. Bookmark the permalink. How did you like the Il Bruciato? I’ve had mixed experiences with it and I find that the quality varies too much from vintage to vintage. Haven’t tried 2011 myself. Cheers! Nice that you had Il Bruciato, John: my own experience with it has been that generally it is well worth its definitely non astronomical price.